The Earth’s crust, continental and oceanic, is composed mainly of sedimentary, metamorphic and igneous rock. Rocks made from igneous or sedimentary rocks that have been subjected to high pressure and very high temperatures. Rocks formed by the accumulation, compaction and cementation of fragments of eroded rock and debris left by living organisms. Layer of granite that gives the continents their essential form. 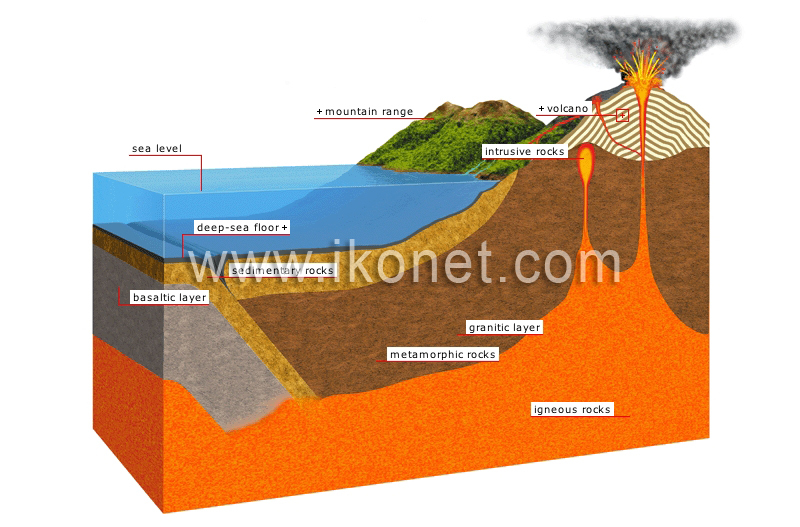 Layer of basalt, a rock denser than granite, that forms the deep-sea floor and is covered with various types of debris. Part of the Earth’s surface beneath the seas and the oceans; its topography is highly variable. Average height of seawater observed for a given time (day, month, year); it is used as a reference point to define coastal features and measure land elevations. Igneous rocks that have risen close to the Earth’s surface. A row of elevated connected landforms characterized by high summits and deep valleys. Landform built up as lava and ash are ejected from the upper mantle during successive eruptions, accumulating and solidifying on the surface. Rock formed from molten magma that has cooled and solidified inside the Earth; also called magmatic rock.